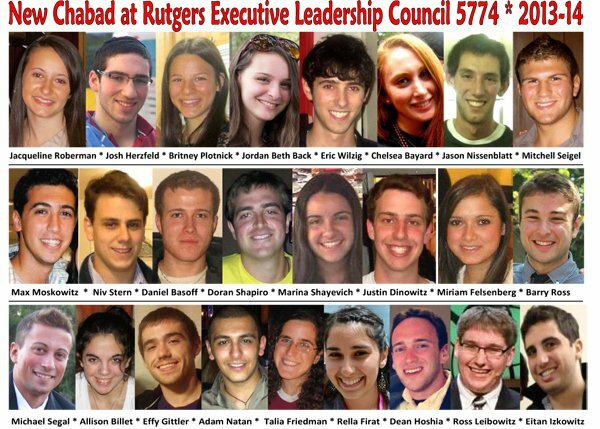 “We’re looking out for you!” No, not the battle cry of the NSA, but the enthusiastic mantra of the newly elected Student Executive Team at the Chabad House at Rutgers University for the upcoming 2013-14 school year. “If you’re Jewish, we want to be Jewish with you!” explained the new team at Chabad's Graduation Program held last week. 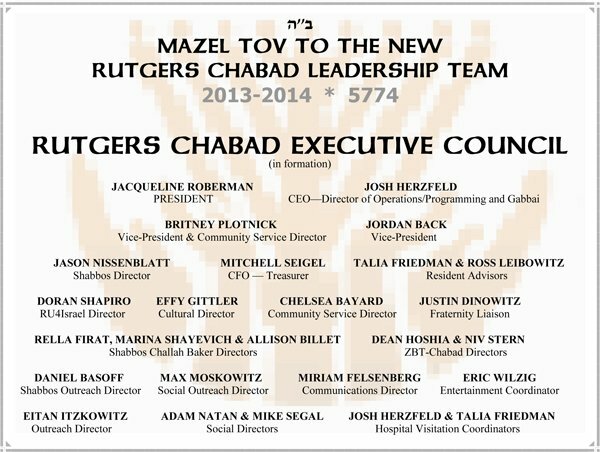 While most colleges throughout the United States struggle to maintain a minimal student leadership committee, things are quite different at the new Chabad House Mega Jewish Student Center at Rutgers University: students passionate about their Judaism and sharing their good feelings about living a Jewish life rise to the occasion in Chabad House and vie for a position of leadership under the direction of Chabad’s Campus Directors, Rabbi Baruch and Sarah Goodman, and Educational Directors Rabbi Shaya and Chayale Shagalow. Chabad’s Executive Director Rabbi Yosef Carlebach also reminds all area college students to apply early for Chabad’s College Avenue Housing and Kosher Meal Program. If you’d like more information or to get on our campus mailing list, please call our student hotline at 732 296-8806 or click on the ‘contact us’ link in this website.